First in line to grab some of your hard-earned retirement income is, no surprise(! ), the U.S. government. The U.S. applies taxes to 50% of your social security benefits if all your non-social-security income and 1/2 your social security benefits add up to $25,000 (single) or $34,000 (joint) filers. The IRS will tax 85% of your social security benefits if the total of other income & 1/2 social security benefits adds up to $34,000 (single) or $44,000 (joint). The actual dollar amount of taxes you pay will depend on your deductions, business income, etc. This troubles me. Doesn’t $25,000/year seem like a really low income to be hitting with taxes? Especially for an age group that will be hit with high health insurance premiums and co-pays? If we and AARP manage to save social security from those who want to gut it, perhaps raising this $25,000/$34,000 number should be the next battle. If you have pension income, it may or may not be taxed, depending on the state and on the type of pension it is. These states have no income taxes, so your pension and/or social security income is safe. Wyoming, Washington, Texas, South Dakota, Nevada, Florida and Alaska. Two states don’t tax pensions or social security (or other income), but they DO tax dividends and interest: New Hampshire and Tennessee. These three states do tax income, but not retirement income (which includes IRAs, thrift plans, 401(k)s, military and other government pensions and deferred compensation programs): Illinois, Mississippi, and Pennsylvania. Other states give you a credit to offset some of the taxes on retirement income — but the number varies greatly from generous to miserly. If you have a military or state government pension, you really must check out each state individually. Military pensions are taxed by 42 states(!) while an also large number will tax pensions from other states. One good source to check is Sapling.com. But this is critical enough to warrant a meeting with a good tax advisor. Taxing groceries is a particularly onerous tax, in my opinion. But 14 states do it. Full state sales taxes are charged on groceries by: Alabama, Hawaii, Idaho, Kansas, Mississippi, Oklahoma, and South Dakota. The following states charge a reduced sales tax for groceries: Arkansas (3%), Illinois (1%), Missouri (1.225%), Tennessee (5.5%), Utah (1.75%), Virginia (1.5% + 1% local option tax), and West Virginia (5%). You can learn which of these states give a tiny credit ($20/year!!!!) to seniors to offset this by going to: Tax Foundation. If your brain is as fried as mine by trying to figure out where, exactly, you’ll be best off tax wise, I recommend this wonderful chart at Kiplinger. Their chart shows you all states rated from worst to best in taxes. And you can highlight five you might be considering and “compare” them on a single page. Plus if you click on the individual states, you get full details about why Kiplinger rated them as they did, taking into account all the taxes in that state. Hint: Based on their work, I’m also writing off Vermont, Nebraska and Utah from my future locations. And who knew Pennsylvania is one of the best tax-wise? Maybe I’ll stay put! 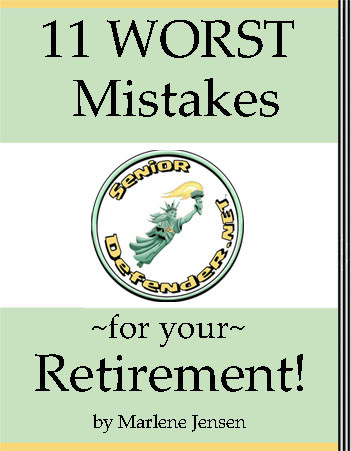 Just make sure if you have a military or state government pension, you double check any state before deciding. How about you? Did the amount you thought you’d have for retirement just shrink substantially? ‹ PreviousHate exercise? Motivation “tricks” that actually work! Great summary of the tax issues associated with where you live in retirement. I also used the Kiplinger chart and created a spreadsheet with lots of other variables that were important to us. Well, the bad news is we ignored all the great advice out there and stayed in California — although we did move to an area less expensive than where we were living prior to retirement. The good news is we love it! In the end, we figured we could make it work, and we just didn’t want to live anywhere else. Regarding federal taxes, if your adjusted gross income is more than $12,000 you will pay taxes, so the Fed probably feels they are being generous to exempt the first $25,000 for seniors.